While dog treats are common, healthy and tasty dog treats are a rarity, which is why Majesty’s Animal Nutrition has developed Majesty’s Buddy Bites and Majesty’s Buddy Bites Omega Wafer to satisfy your dogs taste and nutritional needs. Majesty's Animal Nutrition was started by horse people for horse people. We recognized the difficulty in using powder and liquid supplements and nutrients for horses. We always had problems top dressing feed...our grand children couldn't feed the horses...the ones we wanted to supplement had to be fed separately from the rest of the horses...when they were on pasture, we had to grain them to get supplement into them...and, of course the cost. We set out to develop a new and easier delivery system less expensive for the horse owner. We invented an easy-to-use wafer made of molasses, oat and applesauce processed to assure you everything we put in the wafer remains in the wafer. In other words, they cannot be baked due to temperature sensitivity of supplements and nutrients. We achieve about a 98% feed ability with this product. Joint therapy is a program many experts recommend. 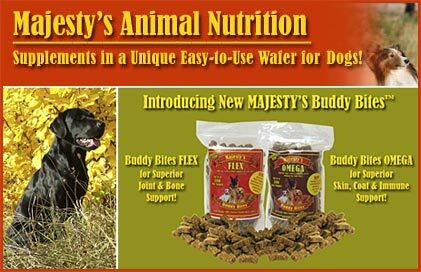 Majesty's Buddy Bites Flex Wafers use supplements identical to what humans consume to increase the dog's range of motion and aid in decreasing inflammation associated with high levels of activity or conditions associated with age such as arthritis. We suggest you always check with you veterinarian before using any supplement. Omega fatty acids are considered essential to supporting a healthy immune system. They also have been shown to support improvement of hair, coat and skin conditions. Studies have shown that a proper ratio of Omega 6 to Omega 3 is highly beneficial in the support of a healthy coat. The proper ratio of Omega 6 to Omega 3 should be about 5:1 to 10:1. Most inexpensive dog foods contain a 24:1 ratio and more expensive dog foods contain a 10:1 to 7:1 ratio of Omega 6 to Omega 3. Our Omega product was developed with a 2:1 ratio to help balance the ratio of Omega that your dog is getting which in turn supports a healthy hair and coat. The knowledgeable people at Majesty's Animal Nutrition are always happy to receive calls and emails. For your convenience, many frequently asked questions are available on their website so that you can get even faster answers to commonly asked questions! Can I Find A Dealer? While you are welcome to order on our website, many stores now carry Majesty's Cookies and we have dealers throughout the country. Because the results are so noticeable and the wafers are so well received by horses, many horse owners wish to become dealers themselves and we welcome your calls! Order Your Majesty Dog Treats Today! If your looking for healthy and tasty dog treats, then Majesty Dog Treats are perfect for you. So what are you waiting for? Order Today!